Made from superior-grade hardboard with a solid fiber core, Jack Richeson Gessoed Hardboard panels are tempered and extremely strong and warp-resistant. The ideal surface for any artist working in acrylics, alkyds or even casein! Panels are 1/8 inch thick and have been double-coated with a high-quality toned gesso resulting in a beautifully even, lightly-toothed surface that bonds perfectly with the hardboard panel and will not separate. 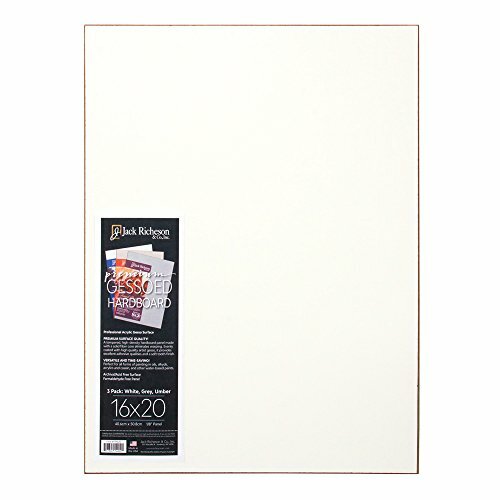 Panels measure 16 x 20 inches and come in white, gray and umber. Sold as a set of 3.